How Many Moons Does Mercury Have? Virtually every planet in the Solar System has moons. Earth has The Moon, Mars has Phobos and Deimos, and Jupiter and Saturn have 67 and 62 officially named moons, respectively. Heck, even the recently-demoted dwarf planet Pluto has five confirmed moons – Charon, Nix, Hydra, Kerberos and Styx. And even asteroids like 243 Ida may have satellites orbiting them (in this case, Dactyl). But what about Mercury? If moons are such a common feature in the Solar System, why is it that Mercury has none? Yes, if one were to ask how many satellites the planet closest to our Sun has, that would be the short answer. But answering it more thoroughly requires that we examine the process through which other planets acquired their moons, and seeing how these apply (or fail to apply) to Mercury. Plutophiles everywhere rejoice. On the eve of history’s first ever up close flyby of mysterious Pluto on Tuesday morning July 14 making the first detailed scientific observations, NASA’s New Horizons has made a big discovery about one of the most basic questions regarding distant Pluto. How big is it? Measurements by New Horizons gathered just in the past few days as the spacecraft barrels towards the Pluto planetary system now confirm that Pluto is indeed the biggest object in the vast region beyond the orbit of Neptune known as the Kuiper Belt. Pluto is thus the undisputed King of the Kuiper Belt! Pluto measures 1,473 miles (2,370 kilometers) in diameter, which is at the higher end of the range of previous estimates. The big news was announced today, by New Horizons principal investigator Alan Stern of the Southwest Research Institute, Boulder, Colorado, during a live media briefing at Pluto mission control at the Johns Hopkins University Applied Physics Laboratory (APL) in Laurel, Maryland. “This settles the debate about the largest object in the Kuiper Belt,” Stern noted. The new and definitive measurement of Pluto’s size is based on images taken by the high resolution Long Range Reconnaissance Imager (LORRI) to make this determination. Pluto was the first planet discovered by an American, Clyde Tombaugh. Pluto is bigger than Eris, another big Kuiper Belt object discovered in 2005 by Mike Brown of Caltech, which is much further out from the Sun than Pluto. The discovery of Eris further fueled the controversial debate about the status of Pluto’s planethood. Eris comes in second in size in the Kuiper Belt at only 1,445 miles (2,326 km) in diameter. 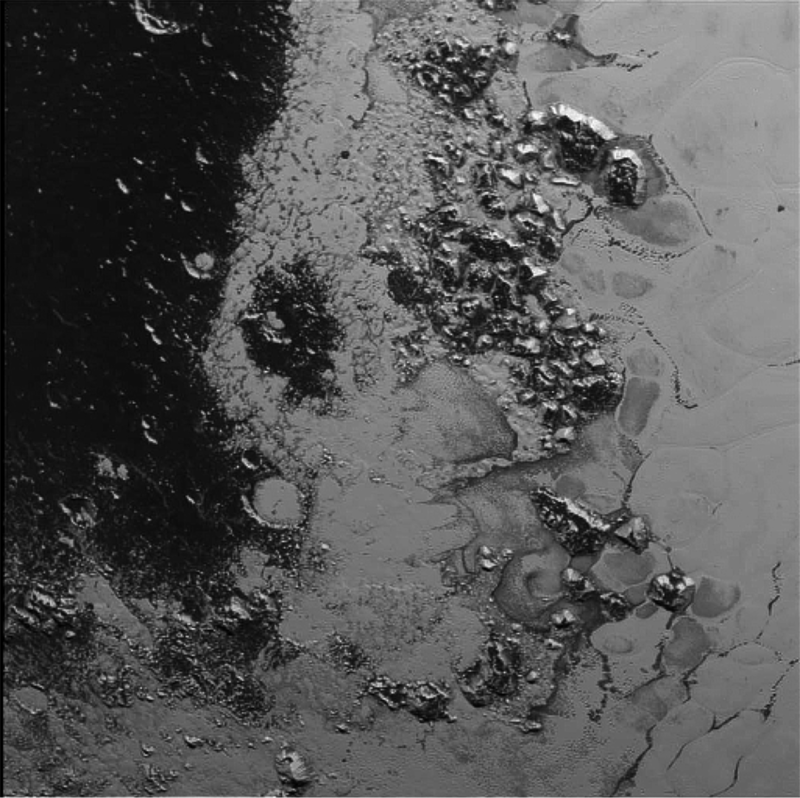 Stern also noted that because Pluto is slight bigger than the average of previous estimates, its density is slightly lower than previously thought. Therefore the fraction of ice in its interior is slightly higher and the fraction of rock is slightly lower. But further data is required to pin the density down more precisely. The uncertainty in Pluto’s size has persisted for decades and was due to the fact that Pluto has a very tenuous atmosphere composed of nitrogen. Furthermore Pluto’s lowest atmospheric layer called the troposphere, is shallower than previously believed. On the other hand, its largest moon Charon with which it forms a double planet, lacks a substantial atmosphere and its size was known with near certainty based on ground-based telescopic observation. New Horizons LORRI imagery has confirmed that Charon measures 751 miles (1208 km) kilometers) across. Stern also confirmed that frigid Pluto also has a polar cap composed of methane and nitrogen ices based on measurements from the Alice instrument. But because they are so small, accurate measurement with LORRI could only be made in the final week prior to the July 14 flyby. Nix is estimated to be about 20 miles (about 35 kilometers) across, while Hydra is roughly 30 miles (roughly 45 kilometers) across. These sizes lead mission scientists to conclude that their surfaces are quite bright, possibly due to the presence of ice. Determinations about Pluto’s two smallest moons, Kerberos and Styx, will be made later at some point during the 16-month long playback of data after the July 14 encounter. It has been three decades since we last visited planetary bodies at the outer reaches of our solar system when Voyager 2 flew past Uranus and Neptune in 1986 and 1989. New Horizons is closing in fast on its quarry at a whopping 31,000 mph (49,600 kph) after a nine year interplanetary voyage and is now less than half a million miles away, in the final hours before closest approach. Watch for Ken’s continuing onsite coverage of the Pluto flyby on July 14 from the Johns Hopkins University Applied Physics Laboratory (APL). Now on the final leg of its journey to distant Pluto the New Horizons spacecraft has been able to spot not only the dwarf planet and its largest moon Charon, but also two of its much smaller moons, Hydra and Nix – the latter for the very first time! What’s more, these images have been released on the 85th anniversary of the first spotting of Pluto by Clyde Tombaugh at the Lowell Observatory in Flagstaff, AZ. Launched Jan. 19, 2006, New Horizons will make its closest pass of Pluto and Charon on July 14 of this year. It is currently 32.39 AU from Earth – over 4.84 billion kilometers away. Along with the distance between Earth and Pluto, New Horizons is also bridging the gap of history: a portion of Mr. Tombaugh’s ashes are being carried aboard the spacecraft, as well as several historic mementos. Each frame in the animation is a combination of five 10-second images taken with New Horizons’ Long-Range Reconnaissance Imager (LORRI) using a special mode that increases sensitivity at the expense of resolution. Celestial north is inclined 28 degrees clockwise from the “up” direction in these images. The dark streaks are a result of overexposure on the digital camera’s sensitive detector. Pluto has a total of five known moons: Charon, Hydra, Nix, Styx, and Kerberos. Pluto and Charon are within the glare of the image exposures and can’t be resolved separately, and Styx and Kerberos are too dim to be detected yet. But Hydra and Nix, each around 25–95 miles (40–150 km) in diameter, could be captured on camera. More precise measurements of these moons’ sizes – and whether or not there may be even more satellites in the Pluto system – will be determined as New Horizons approaches its July flyby date. 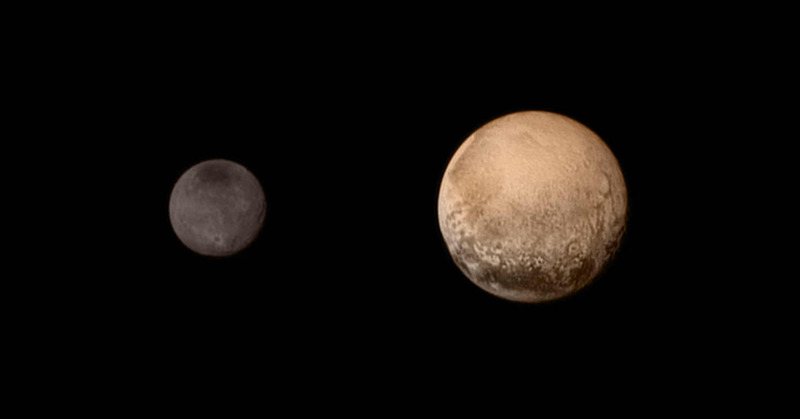 Learn more about the New Horizons mission here. Let’s just casually look at this image of a galaxy 86 million light-years away from us. In the center of this incredible image is a bright loop that you can see surrounding the heart of the galaxy. That is where stars are being born, say the scientists behind this new Hubble Space Telescope image. A “resonance ring” refers to an area where gravity causes gas to stick around in certain areas, and can be the result of a ring (like you see in NGC 3081) or close-by objects with a lot of gravity. Scientists added that NGC 3081, which is in the constellation Hydra or the Sea Serpent, is just one of many examples of barred galaxies with this type of resonance. By the way, this image is a combination of several types of light: optical, infrared and ultraviolet. A smash-up that created Pluto’s largest moon, Charon, likely sprayed debris four billion years ago that formed the genesis of the other moons scientists are spotting today, a new study concludes. The find could explain why the satellites Styx, Nix, Kereberos and Hydra have orbital periods that are, respectively, just about exactly 3, 4, 5 and 6 times longer than Charon’s, scientists said. “Any initially surviving satellites would likely be destroyed in collisions, but these shattered moons wouldn’t be lost; rather, their remains would stay in the Pluto/Charon system and become the starting point for building new satellites,” stated the Southwest Research Institute (SWRI), which led the study. Given Charon’s large size relative to Pluto (it’s a tenth of the dwarf planet’s size, compared to the Earth-Moon 81: 1 ratio), its large mass could easily perturb these smaller moons if they got close. Also, collisions between the debris could alter the orbits “to keep things away from Charon”, the scientists said. 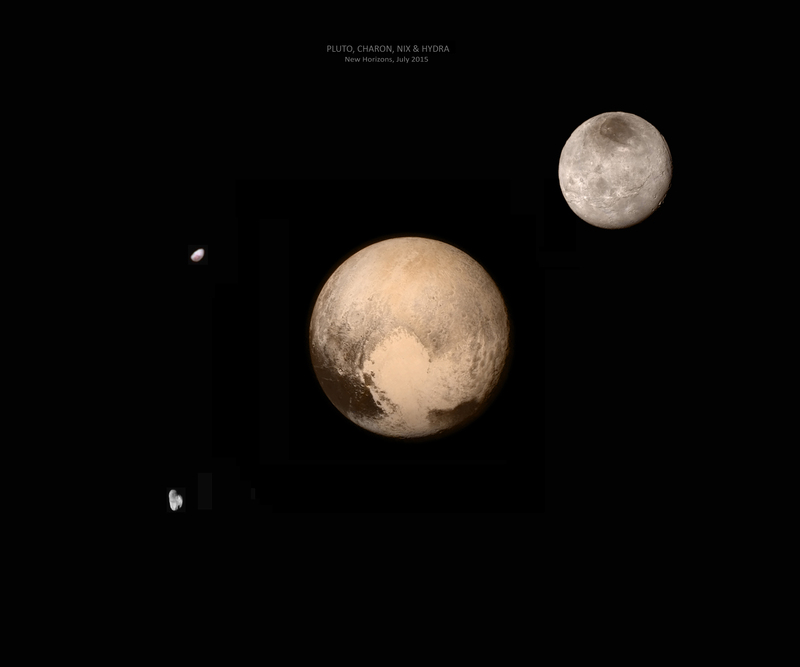 Hopefully we will learn more when the NASA New Horizons spacecraft arrives at Pluto in 2015. The findings were presented yesterday (Oct. 9) at the American Astronomical Association’s division of planetary sciences meeting in Denver; information on whether the results are peer-reviewed was not immediately available. With the New Horizons spacecraft on its way to Pluto, there may be an intriguing additional task for the mission’s science team: look for a potential ring around Pluto and its moons. Researchers at The Universidade Estadual Paulista in Brazil have recently submitted a paper for publication in which they explore the possibility of a ring system around the Pluto-Charon system. In their paper, the team discusses the effects of micrometeoroid impacts on Nix and Hydra and how the resulting dust particles could form a ring around Pluto. The team also investigates forces, such as the solar wind, which would dissipate said ring system. Pryscilla Maria Pires dos Santos and her team provide an exhaustive list of calculations in their paper which estimates the ring system to have a diameter of nearly 16,000 kilometers – well outside the orbits of Nix and Hydra. Based on their calculations, Pires dos Santos state that despite nearly 50% of the ring’s mass being dissipated within a year, a tenuous ring system can be maintained by the dust expelled by micrometeoroid impacts. Additional data presented in the paper places the rings “optical depth” as being several orders of magnitude fainter than even Jupiter’s rings. (Yes, Jupiter has a ring system!) While ground-based observatories and even the Hubble Space Telescope haven’t detected the ring system Pires dos Santos et al. are hopeful that the New Horizons mission will provide data to validate their theoretical models. New Horizons has a dust counter capable of measuring dust grains with a minimum mass of 10-12 grams, which should provide the data required to support or refute the team’s models.